Sun., April 21, 2 p.m. Thu., April 25, 7:30-10 p.m., Fri., April 26, 8-10:30 p.m., Sat., April 27, 8-10:30 p.m. and Sun., April 28, 2-4:30 p.m.
Fri., April 26, 8 p.m. and Sat., April 27, 8 p.m. 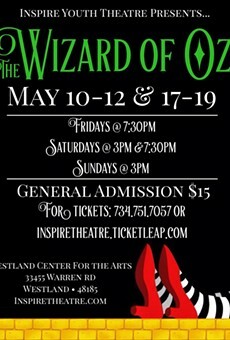 Sat., April 27, 2-3:30 & 4-5:30 p.m.
Inspire Youth Theatre presents, "The Wizard of Oz"
Fri., May 10, 7:30-10 p.m., Sat., May 11, 3-5:30 & 7:30-10 p.m., Sun., May 12, 3-5:30 p.m., Fri., May 17, 7:30-10 p.m., Sat., May 18, 3-5:30 & 7:30-10 p.m. and Sun., May 19, 3-5:30 p.m. Sat., Oct. 5, 8 p.m. and Sun., Oct. 6, 4 p.m.
Wed., Oct. 16, 7:30 p.m., Thu., Oct. 17, 7:30 p.m. and Sat., Oct. 19, 8 p.m.
Fri., Oct. 18, 8 p.m. and Sun., Oct. 20, 4 p.m.
Fri., Oct. 25, 8 p.m. and Sat., Oct. 26, 8 p.m.
Fri., Nov. 15, 8 p.m. and Sat., Nov. 16, 8 p.m. Sat., Dec. 14, 8 p.m. and Sun., Dec. 15, 4 p.m.
Wed., Jan. 22, 7:30 p.m., Thu., Jan. 23, 7:30 p.m., Fri., Jan. 24, 8 p.m. and Sat., Jan. 25, 8 p.m.
Wed., Jan. 29, 7:30 p.m., Thu., Jan. 30, 7:30 p.m., Fri., Jan. 31, 8 p.m. and Sat., Feb. 1, 8 p.m.
Fri., Feb. 21, 8 p.m. and Sat., Feb. 22, 8 p.m.
Fri., April 3, 8 p.m. and Sat., April 4, 8 p.m.